STRICTLY COIN-OPERATED. Smile as fake as it is broad. A corrupt Willy Loman–Glengarry Glen Ross monster whose main product is snake oil. A necessary evil at best. That’s the sales person in the popular imagination and even in some traditional business thinking: Low employee on the totem pole and distant last choice for promotion into general management behind the brainiacs in other functions. If this stereotype were ever true of the people in consistently successful sales organizations — and we doubt it — it is now completely obsolete, especially in the B2B world that is this book’s focus. 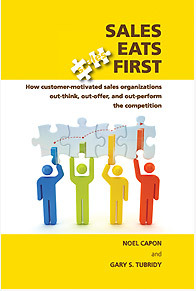 “Noel Capon and Gary Tubridy have for the past decade been leading voices in matters related to sales force effectiveness.